Wanna see my fish balls? Instead of actually going shopping or you know, buying food, I raided our cabinets tonight to make dinner. Difficulty level: Gluten free for four. So I surveyed what was before me, knowing there was some stuff in the freezer but not feeling a desire to defrost anything. So what to do… Then it hit me. Balls! I mixed the salmon in a bowl with cumin, some breadcrumbs, and an egg. 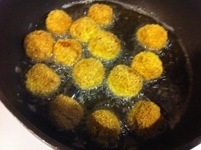 Put a 1/4″ of oil in my tall skillet to heat up, and began rolling the fish into balls, and then coating them in more breadcrumbs. Toss them in the pan, and cook for about four minutes on a side. 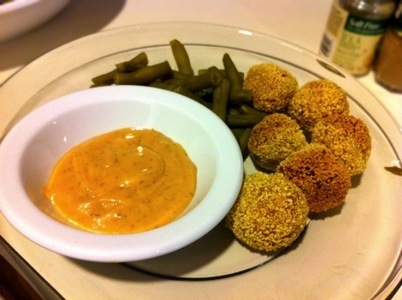 But what good are fish balls without something to dip your balls in? They needed a sauce. Remember, I am going for a certain laziness factor here, so it can’t be a lot of work. To the fridge! I decide to not use the hot sauce, though next time I think I will. But maybe mixed in with the fish, as it would probably work better there. So a big spoonful of mayo goes in the bowl, followed by a bunch of the rest, along with a lemon and dill mix. And of course I drank the beer. That’s a dumb question. This entry was posted in WTF by Joe. Bookmark the permalink. I <3 you for your fish balls and sauce 🙂 Delicious!! !